To apply for an open position at OP&F please click on the open position for which you would like to apply and submit all requested information, which includes uploading your resume. If you do not have internet access or cannot submit your information online, please fax it to 614-628-1753, or mail it to OP&F, Attn: Employment Office, 140 E. Town St, Columbus, OH 43215. 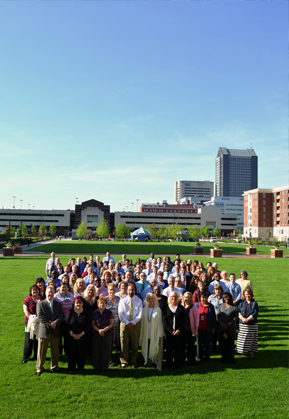 Diverse Staff; United Purpose: OP&F’s staff are diverse in skills, experiences, thought, and strengths, and we work together toward the mission of "securing the future for Ohio’s police and firefighters." Our mission and core values of Prudence, Integrity, and Empathy unite us in the common purpose to serve our members that have taken the oath to protect and serve Ohio communities. OP&F employs a talented and diverse staff of professionals who are committed to the organization’s core values and service to our members. The organization employs over 140 full-time staff members in one of five departments: Administration, Member Services, Information Services, Financial Services and Investments. The Ohio Police & Fire Pension Fund (OP&F) is one of five Ohio public retirement systems and offers a sponsored health care plan as well as pension, disability and survivor benefits to eligible full–time police officers and firefighters in Ohio. The Ohio General Assembly created OP&F in 1965, replacing 454 separate local police and fire pension funds in Ohio. OP&F’s statewide operation began in 1967, when the local pension funds transferred to OP&F assets of $75 million and liabilities of $490 million. OP&F has strived to be a leader and model among retirement systems since 1967 in establishing a financially sound pension fund and operating on an actuarial reserve basis.